BACKGROUND AND PURPOSE: BBA is a rare type of intracranial aneurysm that is difficult to treat both surgically and endovascularly and is often associated with a high degree of morbidity/mortality. The aim of this study was to present clinical and angiographic results, as well as antiplatelet/anticoagulation regimens, of endovascular BBA treatment by using predominantly stent-assisted coil embolization. MATERIALS AND METHODS: Thirteen patients (men/women, 6/7; mean age, 49.3 years) with ruptured BBAs were included from 2 different institutions. Angiographic findings, treatment strategies, anticoagulation/antiplatelet protocols, and clinical (mRS) and angiographic outcome were retrospectively analyzed. RESULTS: Eleven BBAs were located in the supraclinoid ICA, and 2 on the basilar artery trunk. Nine of 13 were ≤3 mm in the largest diameter, and 8/13 showed early growth before treatment. Primary stent-assisted coiling was performed in 11/13 patients, double stents and PAO in 1 patient, each. Early complementary treatment was required in 3 patients, including PAO in 2. In stent-placement procedures, altered periprocedural antiplatelet (11/12) and postprocedural heparin (6/12) protocols were used without evidence of thromboembolic events. Two patients had early rehemorrhage, including 1 major fatal SAH. Twelve of 13 BBAs showed complete or progressive occlusion at late angiographic follow-up. Clinical midterm outcome was good (mRS scores, 0–2) in 12/13 patients. CONCLUSIONS: Stent-assisted coiling of ruptured BBAs is technically challenging but can be done with good midterm results. Reduced periprocedural and postprocedural antiplatelet/anticoagulation protocols may be used with a low reasonable risk of thromboembolic complications. However, regrowth/rerupture remains a problem underlining the importance of early angiographic follow-up and re-treatment, including PAO if necessary. Likewise, the endovascular management of BBAs is challenging, often exacerbated by the small size and unfavorable shape of the lesion. Primary coil embolization carries a high risk of intraprocedural rupture and is often not suitable as a definitive treatment due to the high incidence of early interval regrowth/rebleeding.11 Endovascular trapping or PAO of the affected arterial segment after a successful balloon occlusion test has been suggested as a safe approach.11 However, this may be impossible if the collateral circulation is not intact or important branches (eg, the anterior choroidal artery) arise in too close proximity. Most important, it also increases the risk of ipsilateral ischemia and may prevent EVT for vasospasm. Stent-assisted coil embolization has recently been reported as effective for durable occlusion of a BBA in a case report.12 However, the optimal antiplatelet/anticoagulation regimen for the use of stents in patients with a ruptured BBA remains uncertain, due to the high fragility of these lesions. The goal of this retrospective study was to report the combined experience and treatment strategies, including antiplatelet/anticoagulation protocols, from 2 centers in the EVT of ruptured BBAs by using a predominantly stent-assisted coil-embolization technique. We retrospectively selected all patients who were referred to 2 institutions (Sir Charles Gairdner and Royal Perth Hospitals, Perth, Australia; and Lund University Hospital, Lund, Sweden) for ruptured BBAs. Both institutions have a large tertiary neurointerventional center, and BBAs were not treated endovascularly at either center until 2006. The search included all patients who had undergone treatment of a ruptured aneurysm from January 2006 to May 2009. Aneurysms were included if they had the following blood blister–like morphologic feature on DSA, which was classically described at nonbranching sites of the supraclinoid ICA segments: a typical small, hemispheric bleblike, very broad-neck bulge. However, because BBAs may arise in other areas of the cerebral circulation,7,13 we included all aneurysms showing this morphology in the proximal cerebral arteries accessible for stent-assisted coiling procedures (eg, the ICA or basilar artery). All dissecting vertebral artery aneurysms showing luminal narrowing were excluded. Atypical saccular, wide neck, and possibly partially thrombosed BBAs were only included if they were found at nonbranching sites of the supraclinoid ICA. Several other studies have reported that the latter may develop from typical small BBAs due to lesional growth with time in that location.3,4,14 Size and morphologic characteristics of all BBAs were analyzed by 2 experienced interventional neuroradiologists on the preprocedural angiograms and CTAs (W.M. and M.C.). A total of 13 patients from both institutions (6 men, 7 women; mean age, 49.3 years; range, 35–70 years) were included. The clinical grade (HH) at treatment and the severity of the SAH assessed by the Fisher scale were recorded in all patients. If EVT was not initiated immediately following the first angiogram, all further follow-up DSAs or CTAs or both were reviewed for morphologic changes and/or interval growth of the BBA before treatment. All baseline patient characteristics (HH and Fisher grades) and angiographic findings (BBA location, size, neck/dome ratio, and interval growth) are summarized in Table 1. All treatments were initiated after multidisciplinary agreement between experienced vascular neurosurgeons and interventional neuroradiologists from the 2 involved academic neurovascular centers. All procedures were performed with the patient under general anesthesia. Eleven of 13 patients underwent primary stent-assisted coil embolization; 1 patient underwent double stent placement only; and in 1 patient, PAO was performed by using bare platinum coils. Various bare platinum coils (GDC, Boston Scientific, Natick, Massachusetts; Ultipaq, Micrus Endovascular, San Jose, California; Axium, ev3, Irvine, California; HyperSoft finishing coil, MicroVention, Aliso Viejo, California) and hydrogel coils (HydroSoft) were used. For stent-placement procedures, self-expandable Neuroform (n = 8) and Wingspan (n = 1) stents (Boston Scientific) or Enterprise stents (n = 3; Cordis, Johnson & Johnson, Roden, the Netherlands) were used. In cases of complementary treatment, the time, indication, and strategy were evaluated. All procedures were performed with the patients under systemic heparinization, which was usually started before the placement of the guide catheter to maintain the ACT 2–3 times above baseline (initial heparin bolus of 4000–5000 IU, in some cases followed by additional boluses of 1000–3000 IU). However, preloading with aspirin and/or clopidogrel, which is normally initiated within days before intracranial stent-placement procedures (clopidogrel, 75 mg/day, and aspirin, 75–100 mg/day, for 5 days; or clopidogrel, 300 mg bolus, and aspirin, 75–150 mg bolus, 3 days in advance followed by clopidogrel, 75 mg/day, and aspirin, 75–100 mg/day, for 2 days), was, in these cases, individually modified due to the fragile nature of ruptured wide-neck BBAs. Consequently, the peri- and postinterventional antiplatelet/anticoagulation regimens differed in each case and were defined individually by the operating neurointerventionalist. All data of antiplatelet and anticoagulation treatment (choice of drugs, doses, timing, and duration) were recorded and summarized. All patients were screened for cerebral vasospasm with daily transcranial Doppler sonography (at 1 participating center, screening was not performed during weekends). If cerebral vasospasm was confirmed by DSA or the patient presented with clinical deterioration, medical or endovascular treatment (ICAP or BAP) or both were initiated, depending on angiographic location, severity, and clinical presentation. Follow-up DSA, CT/CTA or MR/MRA, or both CT/CTA and MR/MRA posttreatment were scrutinized. Initial and follow-up anatomic results were based on DSA by using the commonly used Raymond scale as described by Roy et al15: complete occlusion, “dog ear” (corresponding to a unilateral residual neck), residual neck, and aneurysm body filling or failure. In all patients, the clinical outcome was evaluated at hospital discharge by using the mRS. Further clinical examinations, including mRS assessment, were performed on subsequent outpatient visits either by the vascular neurosurgeon's or the neurointerventionalist's team from both centers. At hospital admission, 7/13 and 6/13 patients showed good (HH 1–2) and poor (HH 3–4) clinical grades, respectively. One patient had a rehemorrhage before treatment and deteriorated from HH 2 to 3 (patient 7), 3 patients improved clinically during the time interval before treatment (from HH 3 to 2, 3 to 1, and 2 to 1, respectively). Nine of 13 patients had extensive SAH on initial CT (Fisher 3–4), 2/13 had minimal SAH (Fisher 2), and 2/13 had negative CT findings (Fisher 1) but positive lumbar puncture results. Two aneurysms were initially not identified on CTA, and 1 was misinterpreted as a vascular irregularity on initial DSA (patient 7). Nine of 13 BBAs were <2 mm in largest depth on initial DSA. Four patients were treated at the time of initial angiography due to typical BBA appearance. An increase in aneurysm size (up to 2 times baseline dimensions) was observed in 8/9 of patients (89%) who had an angiographic follow-up between 4 days and 10.5 weeks following the ictus for delayed treatment (Fig 1. At the time of treatment, BBA size was ≤2 mm in 6, >2–7.9 mm in 5, and ≥8 mm in 2 patients. Eleven of 13 BBAs had a typical location (ie, at a nonbranching site of the intradural ICA, C6 or C7 segments). Of these, 6 were anteromedial (55%), 2 were posteromedial, and 3 had various positions on the ICA wall. Two of 13 BBAs were found in the basilar artery trunk as excentric dilations on the anterior and anterolateral wall, respectively (Fig 2 )). Two ICA BBAs (patients 9 and 12) were rather large blisterlike lesions (maximal neck-to-dome height, 8 and 12 mm); 1 of these was partially thrombosed. Three BBAs showed angiographic abnormalities of the artery lumen in the vicinity of the BBA with stenosis proximal to the BBA (n = 2) and/or dysplastic changes (n = 2). The size of the aneurysm neck was less than double the maximal dome height in 10/13 BBAs (neck/dome ratio ranging from ∼1–2). Three BBAs had a particularly unfavorable anatomy with a neck/dome ratio of >2. A 50-year-old male patient presenting with HH grade I SAH. A, Transorbital view of the right ICA angiogram shows a small 1.3 × 1.7 mm BBA on the posteromedial ICA surface (arrow) on day 1 after ictus. B, Subsequent follow-up angiogram on day 4 shows no increase in size of the BBA (arrow). C, On day 10, marked expansion of the BBA, now measuring 2.6 × 2.9 mm, is noted (arrow). Stent-assisted coiling was subsequently performed on the same day. D, The final angiogram after placement of a single coil shows some residual filling of the BBA (arrow). E, Unsubtracted view of the final ICA angiogram after treatment demonstrates a single GDC coil inside the BBA (short white arrow) and end markers of the Neuroform stent within the supraclinoid ICA segment (long thin white arrows). 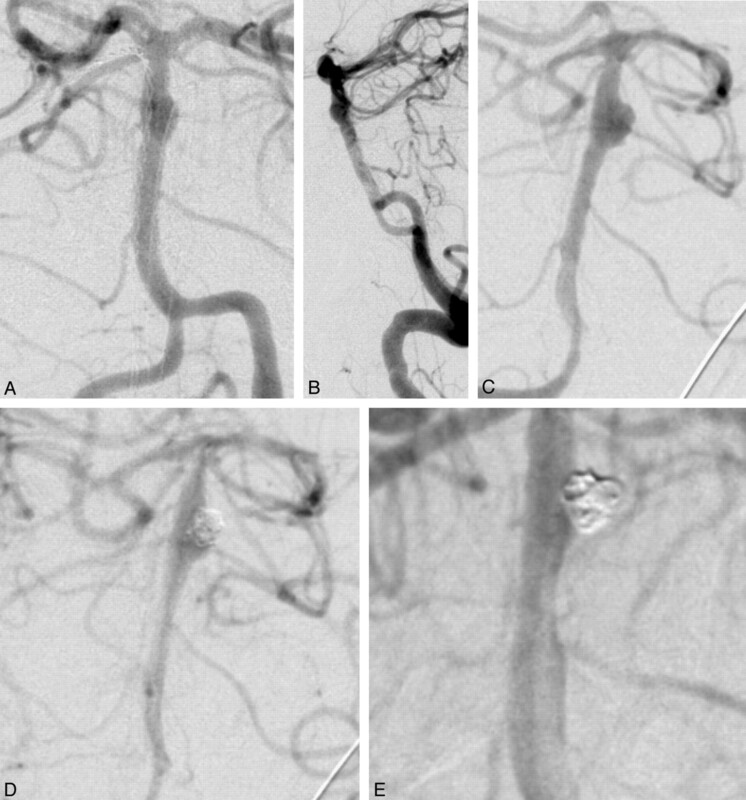 F, Follow-up angiogram obtained 16 months after treatment reveals complete occlusion of the BBA. A 49-year-old female patient who presented with severe SAH (Fisher/HH grades, 3/4). 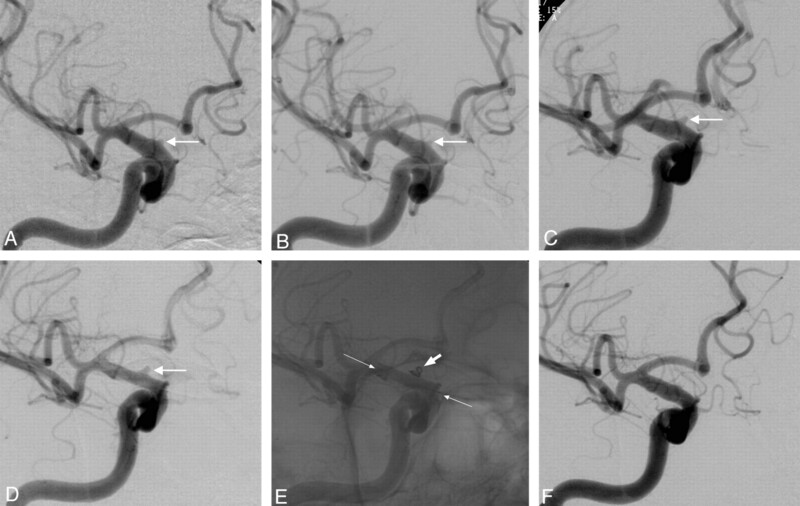 A and B, A very broad-based small BBA is found in the distal basilar artery trunk on initial DSA. C, At early angiographic follow-up on day 6, considerable growth of the BBA is noted (4.8 × 2.1 mm), prompting stent-assisted coiling. D, Angiogram immediately after treatment discloses residual proximal aneurysm filling. E, At 3 months' angiographic follow-up, progressive occlusion with a tiny dog ear remnant is evident. The patient made an excellent clinical recovery (mRS 1) at 5-month follow-up. Treatment techniques of all patients are summarized in the On-line Table. Eleven patients (85%) were treated with stent-assisted coiling. One patient (patient 6) was treated with primary PAO (ICA trapping) after successful balloon test occlusion, and 1 patient (patient 7) underwent stent monotherapy by using 2 overlapping stents (Neuroform, 4.5 × 15 mm). Reasons to perform PAO and stent monotherapy were the BBA proximity to the ostium of the anterior choroidal artery in 1 and minimal BBA depth combined with hazardous microcatheterization in the other patient. Complementary EVT was performed in 3 patients: PAO in 1 (patient 7) and additional coiling in 2 (patients 9 and 12), of whom 1 required a tertiary PAO treatment due to late aneurysm regrowth at 6 months (patient 9). The peri- and postprocedural anticoagulation and antiplatelet treatments are summarized in Table 2. All patients received periprocedural heparin; however, postprocedural heparinization regimes varied widely. Six of 12 patients (50%) who underwent stent-placement procedures had intravenous heparinization for 12–72 hours followed by subcutaneous LMWH (enoxaparin) for 6–7 days in 2 patients, 1/12 patients received only low-dose subcutaneous heparin for 2 weeks, and 5/12 had no postprocedural heparin at all. Only 1 and 4 patients, respectively, received a loading dose of clopidogrel (300 mg) and aspirin (300–320 mg), before EVT was started. In 8/12 stent procedures (66.7%), a loading dose of clopidogrel (150–300 mg) was given orally (via NGT) during the procedure, either immediately before or after stent ± coil placement. Simultaneously, a bolus of aspirin (300–650 mg) was given, orally (via NGT) in 1/12 and intravenously in 4/12 patients. An off-loading dose of either clopidogrel (300 mg, NGT) or aspirin (650 mg, IV) only was given in 3/12 and 1/12 patients, respectively. Thus, 4/12 patients with stent procedures (33.3%) received a loading dose of a single antiplatelet therapy only perinterventionally. One patient (patient 6) who underwent primary PAO received no loading dose of aspirin or clopidogrel. Clopidogrel (75 mg) and aspirin (75–150 mg) were given as postprocedural maintenance therapy in 7/12 patients with stent procedures (range, 1–3 months and 3 months to lifelong, respectively). One patient received only clopidogrel (75 mg) for 2 months, and 2 patients had only aspirin (150 mg) for 4 weeks and lifelong, respectively. Both clopidogrel and aspirin were stopped in 1 patient who had an early rehemorrhage 2 days following treatment and died (patient 4). Clopidogrel was stopped after 3 days in 1 patient who developed early but asymptomatic rebleeding following stent monotherapy (patient 7). The patient who underwent immediate PAO had no antiplatelet therapy after treatment. During EVT of BBAs, no device-related complications occurred. In 2 patients with stent procedures (15.4%), transient in-stent fibrin formation occurred, which resolved spontaneously without distal embolization on DSA or adverse neurologic events. One of these patients (patient 7) had stent monotherapy (double stents) with intraprocedural loading doses of aspirin and clopidogrel. The other patient (patient 10) with coil protrusion (a single-coil loop beside the stent) was given a procedural bolus of clopidogrel but no aspirin. In all other patients, no thromboembolic complications or delayed infarcts were disclosed. An attempt at primary coil occlusion resulted in coil protrusion into the ICA, which was then successfully remodeled by using a Wingspan stent (patient 11). During hospital admission, moderate-to-severe cerebral vasospasm was encountered in 7/13 patients (54%), 1 patient required treatment with balloon angioplasty, and 3 patients underwent intra-arterial chemical treatment only. Complications and vasospasm treatment are summarized in the On-line Table. The angiographic and clinical outcomes are summarized in the On-line Table. Immediate complete occlusion of a BBA was encountered in 4/13 patients (30.8%), including 1 case of primary ICA trapping. In these cases, no delayed recanalization or regrowth of a BBA was found on later follow-up angiography. In the remaining BBAs, posttreatment angiograms disclosed a residual aneurysm neck or dog ear in 4/13 and residual filling of the aneurysm body in 4/13, respectively. The 1 patient who died from early rehemorrhage had residual aneurysm filling after stent-assisted coiling. In 4 patients, early follow-up angiography with serial DSAs was performed at various intervals, depending on the final angiographic result after treatment (range, 5 days to 1 month). Four patients underwent additional early CTA (n = 2) and/or MRA (n = 3) (range, 5 days to 2 months). If progressive obliteration of residual aneurysms was observed, the angiographic follow-up interval was subsequently prolonged. The long-term imaging follow-up was variable: 11 patients had DSA follow-up (1–6 studies; range, 3–21 months). Among those, angiographic follow-up was later subsequently switched to noninvasive CTA (n = 1) or MRA (n = 3) at 12–24 months. Two patients were primarily followed with MRA; 1 of these had undergone primary PAO of the ICA with stable occlusion. The only case of stent monotherapy (patient 7) showed residual aneurysm filling postprocedure. Due to aneurysm regrowth in the early follow-ups and asymptomatic rebleeding, a secondary PAO was performed 3 weeks after the initial treatment. Two patients with atypical relatively large ICA BBAs and initial residual neck filling showed aneurysm recanalization. One of these patients showed early aneurysm regrowth (3 weeks following the procedure, patient 9) and underwent recoiling with subsequent PAO at 5.5 months due to further regrowth. The second of these patients (patient 12) showed delayed aneurysm recanalization, which required recoiling at 6 months. This second delayed procedure was complicated by thrombus formation, which was successfully lysed with intra-arterial abciximab (ReoPro) without any neurologic sequelae. This BBA showed a stable occlusion at 24 months' follow-up. Three and two aneurysms of the remaining patients with neck remnants proceeded to complete obliteration and showed progressive occlusion with a small dog-ear–like neck remnant on follow-up DSA, respectively. At the time of retrospective record analysis, the length of clinical follow-up ranged between 5 and 27 months (mean follow-up interval, 12 months). A good functional outcome (mRS 0–2) was achieved in 10/13 patients (76.9%) at discharge from the hospital and in 12/13 patients (92.3%) at midterm follow-up (6–27 months). One patient died (mRS 6) from an early rehemorrhage. Our findings indicate that most BBAs are found in the supraclinoid ICA; however, other vessels, in particular the basilar trunk, should be considered as potential target locations that require thorough assessment in otherwise unexplained SAH. Initial CTA as well as DSA (2 of our cases) may be false-negative in the setting of acute SAH due to the sometimes minimal initial size of the BBAs combined with a close relation to the skull base.5 In addition, BBAs might be obscured by luminal irregularities on DSA related to atherosclerosis in the adjacent arteries, which have been reported in other studies at surgical inspection as well as on pathologic analysis.1,2,6 On DSA, multiple angiographic projections are often necessary to disclose their presence.6 For certain cases, repeated DSAs, including 3D angiographic studies, may be necessary to reveal the presence of a BBA. For BBAs of the basilar artery, we found oblique projections as well as 3D rotational DSA studies particularly helpful. Some BBAs may have typical morphology on initial angiography and should then be treated as soon as possible because of their risk of early rerupture. However, if treatment appears difficult or diagnosis of target lesion is in doubt, our results emphasize that short-term morphologic changes and/or rapid aneurysm enlargement on early follow-up angiography are very good indicators of a BBA. This finding is in agreement with other investigators,4,16 and this pattern developed in 8/9 patients of our series (89%) who underwent repeat preprocedural angiography. Various surgical and endovascular techniques have been attempted in the past for treatment of ruptured BBAs. Primary surgical clipping or wrapping has been considered too hazardous due to the high fragility of the BBA wall, and it is often associated with poor outcome.1–4,6 Likewise primary coiling may be very dangerous given the lesion's wide neck and hemispheric dome with a very weak wall lacking collagenous tissue.11,16–19 Deconstructive endovascular trapping after a balloon occlusion test was suggested as a definitive and safe approach for treatment of BBAs in the ICA.11 However, this option may not be possible if collateral circulation is not sufficient or in other locations where important branching arteries arise close to a BBA. Moreover, PAO may also interfere with endovascular access for later vasospasm treatment. Meling et al17 reported a particularly poor outcome in patients after surgical ICA sacrifice due to development of early as well as delayed cerebral infarcts. The latter occurred even though spontaneous cross-flow was evident on preoperative angiography, presumably as a consequence of vasospasm-induced compromise of cerebral collateral flow. Recently, Kim et al12 reported a case of successful BBA treatment with reconstructive endovascular methods by using stent-assisted coil embolization followed by stent-in-stent deployment. The results of our series demonstrate that stent-assisted coiling of BBAs is technically challenging but a relatively safe mode of treatment. The principal indication for using stents with or without coiling in our series was a combination of a shallow aneurysmal sac and a wide neck. A neck/dome ratio between ∼1 and 2 is “broad neck” by definition, unfavorable for coiling alone and therefore a good indicator for using stents. If the BBA anatomy is even more unfavorable (ie, with a neck/dome ratio of >2), a single stent may only help to hold the coils in place but not provide sufficient additional flow-diversion to exclude an extremely wide aneurysm neck. Thus, double-stent placement/high-attenuation meshed stents with additional coiling or even primary PAO in very long-segmental lesions may be considered. The technical challenges are mainly related to the oftentimes small size, shallow morphology, and very fragile nature of a BBA. Furthermore, these lesions are often located in close relation to vascular curves (ie, the location and orientation of the BBA is commonly unfavorable, necessitating a difficult and very gentle microcatherization maneuver to get access to the BBA while avoiding potential perforation). However, we would not generally advocate double-stent placement without coiling as a primary treatment option because the likelihood of a residual or a recurrent aneurysm requiring further treatments was reported to be high at 50%.20 Furthermore, this also imposes an increased risk of BBA rehemorrhage. However, our data are limited to a single case of double-stent monotherapy that has shown regrowth with slow rebleeding. Likewise, we would not favor PAO as the primary therapy option in ruptured BBAs for the above-mentioned reasons, unless the target BBA involves a very long segment with associated dysplastic wall changes (patient 6). PAO remains an option but should be avoided until the risk of secondary SAH-induced vasospasm subsides. The use of covered stents as another EVT option for BBAs appears logical to treat a focal weakness of the arterial wall rather than the aneurysm sac, assuming that they actually represent pseudoaneurysms with potentially underlying focal disscetion. However, the present limited experience with covered stents in BBAs shows that the current technology may put the patient at additonal risk for vessel wall injury with potentially devastating intraprocedural rupture.16 In addition, BBAs are often located in close proximity to the origin of the posterior communicating artery and the anterior choroidal artery, making the use of a covered stent less suitable. Alternatively, particularly in locations with important branching arteries, multiple overlapping stents or the recently introduced flow-diverting stents may be used with or without simultaneous coiling.7,12,16,20–22 The given reports suggest that these devices can be used with a low risk of obstructing side branches and/or small perforating arteries. However, with the use of higher attenuation meshed stents, careful adjustment of peri- and postinterventional anticoagulation and antiplatelet therapy remains critical, in particular in BBAs without simultaneous coiling due to a high risk of rerupture. Therefore, the benefits and potential drawbacks of the use of flow-diverting stents (eg, Pipline, Chestnut Medical Technologies, Menlo Park, California; or Silk devices, Balt Extrusion, Montmorency, France) in ruptured BBAs need to be assessed in future studies. Lee et al16 recently presented a small mixed series of endovascular reconstructive treatment including stent-assisted coiling (n = 3), stent-within-stent embolization (n = 3), and covered-stent placement (n = 3). In contrast to our results, they observed regrowth of the BBA in all of their stent-assisted coiling cases, whereas the primarily stented BBAs (either with overlapping stents or by using a covered stent) showed a more durable occlusion. However, the number per treatment group in their series may be considered too small to draw a definite conclusion about the optimal EVT strategy for BBAs. Furthermore, another important factor for these discrepant results might be the differences in the peri- and postinterventional anticoagulation regimens. In their series, a full-dose heparinization for 24–48 hours as well as dual antiplatelet therapy was initiated posttreatment. In contrast, we intended to use preferentially less antiplatelet agent and/or heparin than generally used for stent-assisted procedures in unruptured intracranial aneurysms. The individual decision was left to operator preference, individual patient anatomic factors, and the degree of BBA occlusion on the final angiograms. The rationale for this was to reduce the risk of or consequences of procedural rehemorrhage in the treatment of these fragile BBAs. Antiplatelet agents were generally given just before or after stent deployment, and it is evident that we had only minimal or more likely no platelet inhibition during the procedure. Nevertheless, we assumed that the risk of early fibrin formation or clotting was presumably not so important in the presence of a high-flow state within the stented lumen of large-sized basal arteries (eg, the ICA and basilar artery). Transient fibrin formation, which spontaneously dissolved, was noted in 2 patients. Although our results were not proved by a large number of cases, we believe that they indicate that intracranial stent placement can be performed without full preloading of antiplatelet agents (clopidogrel and/or aspirin) and with a modified or truncated posttreatment regimen in selected cases of acute aneurysmal SAH. One-third of our stent-assisted procedures was followed by single antiplatelet maintenance, and 50% received no continuation of heparin at the end of the stent-placement procedure. Furthermore, no symptomatic thromboembolic event or delayed in-stent thrombosis was observed in our series, and our results appear promising in regard to the use of reduced postinterventional anticoagulation protocols in these high-risk BBAs. Among the 11 patients who were primarily treated with stent-assisted coiling, only 1 fatal rehemorrhage was observed. The remaining patients showed an excellent clinical outcome at 12 months (mRS 0–2). However, early reperfusion and regrowth of BBAs may still occur after stent-assisted coiling or stent monotherapy and can put the patient at risk for rebleeding. This potentially dangerous condition was only observed in BBAs that showed incomplete occlusion (neck remnant or residual aneurysm) at completion of the first procedure and especially if the affected lesion was atypically large or partially thrombosed. Therefore, we strongly recommend performing early follow-up angiography in all incompletely occluded BBAs, initially at very short time intervals, which can subsequently be increased once the residual aneurysm shows a stable obliteration rate and morphology. Delayed complementary treatment either by repacking or PAO was found to be safe, with good clinical and angiographic results in our series. It was evident that all cases of regrowth and rehemorrhage had received continued double antiplatelet therapy, and the case of fatal rehemorrhage had also undergone continued heparinization for 48 hours. Therefore, it might be favorable and sufficient to keep the patients on a modified reduced antiplatelet regimen, perhaps a loading single dose of clopidogrel with maintenance ongoing aspirin or in combination with a short course of heparinoids after the procedure to prevent rehemorrhage and minimize thromboembolic complications. The use of LWMH (ie, enoxaparin) may, to some extent, seem controversial in this group of patients because it is not fully reversible. However, it can be partially reversed (≤60% for factor Xa) and has been used by 1 of the 2 involved centers (Lund University Hospital) for >1 decade in cases of coiled ruptured cerebral aneurysms without acute and subacute rehemorrhage or other potential adverse events. Stent-assisted coiling for treatment of ruptured BBAs is technically challenging but feasible. It may be performed potentially with altered or reduced heparinization and antiplatelet routines to treat these very fragile lesions. This method, unlike PAO, allows ongoing direct access to vessels for aggressive endovascular therapy of subsequent SAH-induced vasospasm if needed. Regrowth and early rerupture remain a problem, particularly in incompletely occluded BBAs. Therefore, vigorous and repeated short-term angiographic follow-up is warranted. Retreatment, including delayed PAO, may be necessary for definite occlusion under such circumstances. Apart from a single fatal early re-hemorrhage, the midterm angiographic and clinical outcome was excellent in our series. Accepted after revision September 14, 2010.